This 100% cotton genuine Weber barbecue mitt is coated in special flame retardant coating. Constructed to extra length to protect your forearm from spitting fat and even the occasional flame. Finished in black with large Weber logo. 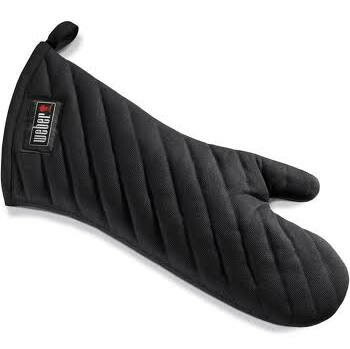 This 100% cotton genuine Weber barbecue mitt is coated in special flame retardant coating. Constructed to extra length to protect your forearm from spitting fat and even the occasional flame. Finished in black with a large Weber logo. 100% cotton mitt with a terry cloth inner Heat-resistant and comfortable Extended cuff protects hand and forearm Weber kettle logo.